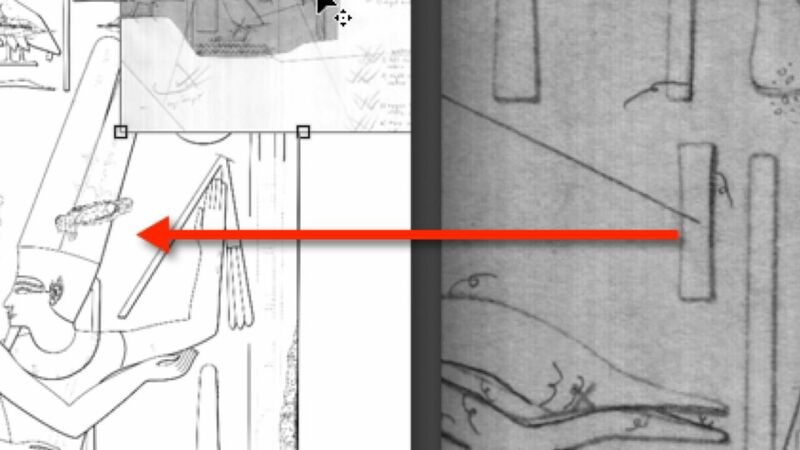 Although the digital inking method that was specifically developed for documenting the remains of some late Roman murals will be explained in another chapter, the multiple ways in which data is initially captured at Luxor Temple justify a brief introduction here. 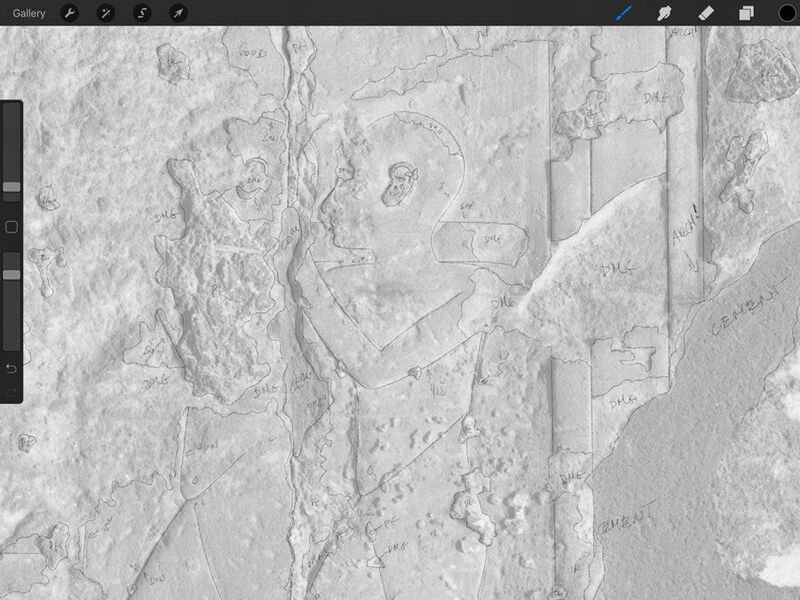 While the fresco remains were originally recorded in the Survey's traditional fashion (see Chapter 1, Section 2), some of the contextual information was added on the iPad Pro using Procreate. (1)Carved lines and damage information as captured on the iPad Pro using Procreate. The downgraded digital negative has to be replaced with its high-resolution counterpart when preparing for studio work. (2)Smaller sections of the master background are collected in a Procreate folder with the appropriate numbering. 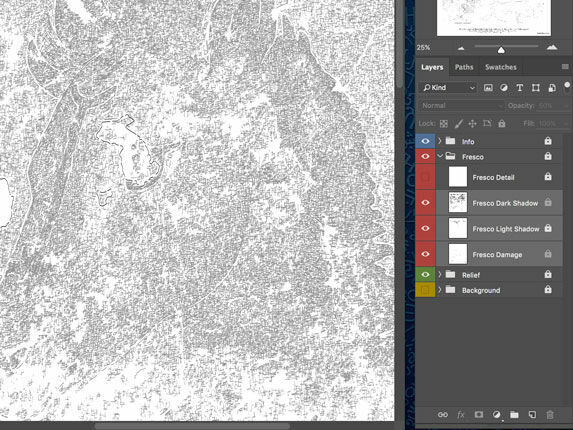 As soon as a digital pencil drawing is finished, it is transferred back to the Master Background for further alignment and compatibility check. 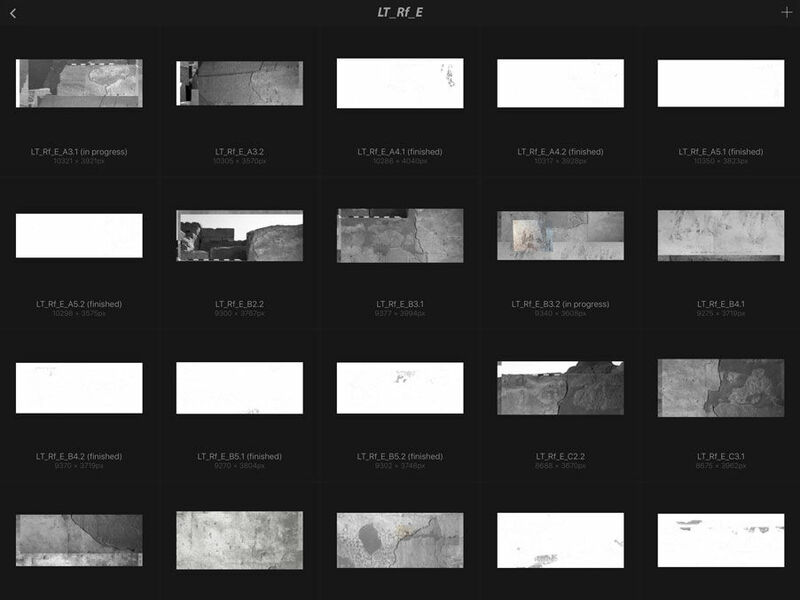 (3)All the different sections are collected and aligned in the collective file that is used for studio work. Each segment is placed in its appropriate folder according to the drawing method and the device that was used for initial penciling. 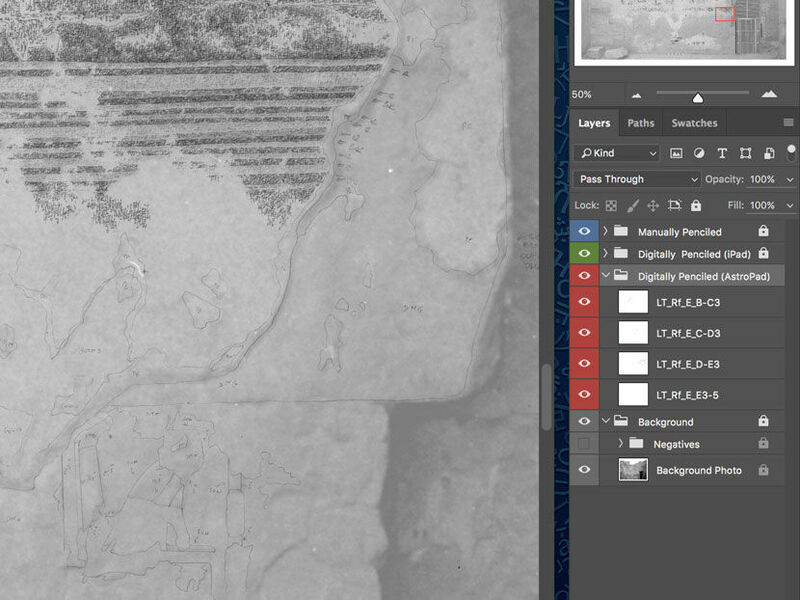 (4)Some digital files that are drawn directly in Photoshop running on the Mac, utilizing the iPad via Astropad, can provide color backgrounds for the better understanding of faded and damaged decorative surfaces. 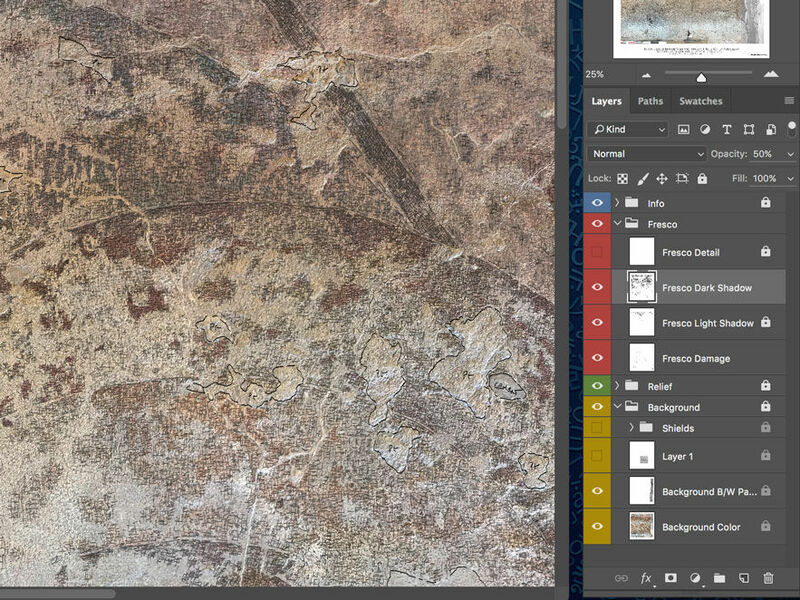 (5)Being able to draw the fresco texture in full desktop Photoshop in the field means the artist doesn’t have to reproduce certain layers in the studio, saving time that can be focused on other aspects of the documentation work. The use of a less powerful digital drawing board, such as the iPad Pro, certainly entailed careful planning in advance: a detailed, proportional, and perspective corrected photo mosaic of each wall section had to be created beforehand, which became the master background for the entire project. This immense file was divided into smaller sections with some overlap, and it was downgraded to a manageable resolution before being transferred for work on the iPad. 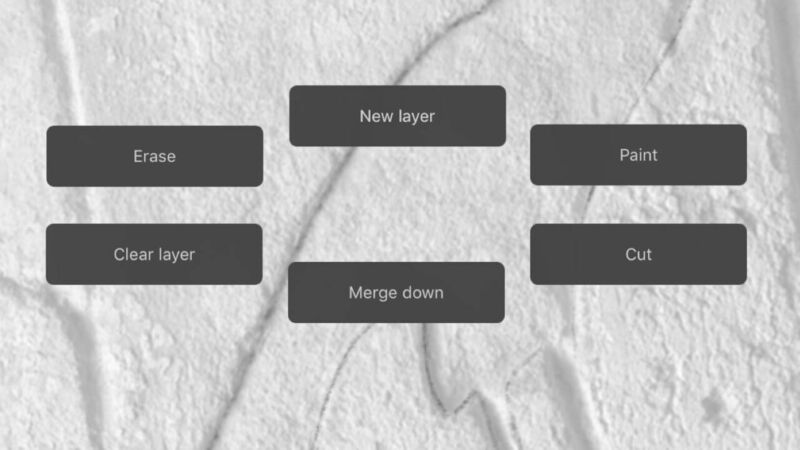 Later on, as Astropad was released in the App Store, even some of the traditional fresco texturing that was previously done on photo enlargements could be changed to its digital equivalent, significantly shortening studio time. In the end, all the information that is captured on enlargements, the iPad Pro, the Companion, or even on the studio computer using Astropad, seamlessly blends together to become a multi-layered digital background that forms the foundation for digital inking.